10engines: north star glove co. 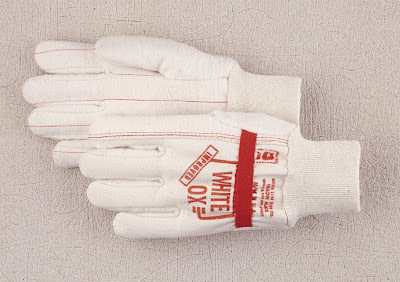 There are several aged American canvas-work-gloves manufacturers still in existence today (e.g. 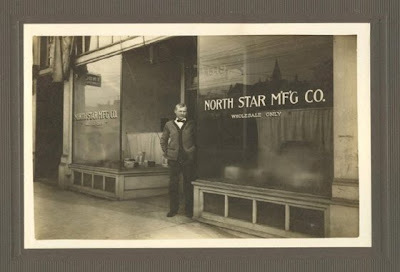 Galeton, Brookville), but July marked the centennial of Washington state's North Star Glove Company. 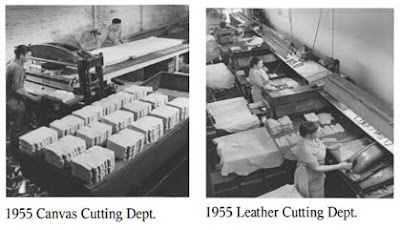 North Star produces “cut & sewn” types of canvas and/or leather work gloves in a multitude of patterns and variations. This selection of USA made gloves gets sold predominantly in the western states, Alaska and Canada, and the Southeastern lumber producing states. The family-owned, Tacoma WA-based company manufactured its first pair of gloves on July 9, 1910 and recently celebrated its centennial, quietly. They graciously answered my request for more info and some images; which I have paraphrased below. The company was founded by Albert Wekell (seen above), a sturdy and adventurous Swede. Wekell arrived in Tacoma from Sweden around 1890 and ventured out to Alaska and the Yukon in the early 1900s Gold Rush. He didn't find his wealth there, however struck it rich by playing cards on the riverboats and steamers with successful miners and ship captains on his return to Seattle. With that start, young Albert bought some machines and material to start North Star Manufacturing in Tacoma. Serving mostly the logging trade of the area, he would ride the local trolley car to the commercial wilderness out along McKinley Avenue where the logging camps started and sell his gloves to the merchants set up nearby. With that money he would return to town and buy new material to make even more gloves; thus pushing his selling territory out further and further. Fast forward to 2010; the company remains in the family managed by corporate President Rob Wekell and brother Tom -Albert’s grandnephews. Further reading. Over the past century, America could count at least a thousand glove manufacturers. Today, according to Rob Wekell, there are now barely a hundred – as small plants have been subsumed by larger companies, or moved offshore where labor and materials were cheaper, or simply closed. Thousands of jobs have disappeared in the last 10 years in the Northwest. That includes aluminium, lumber and plywood jobs. “During a recession, we go back to our basic product lines. People go back to the basics.”, Rob says. 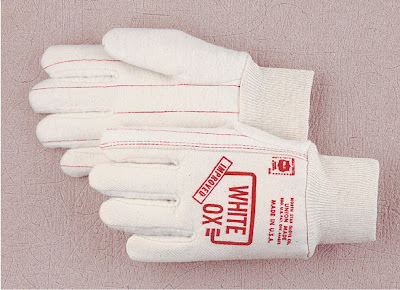 That means basic products; for example their White Ox brand canvas glove, produced since 1933. Billed as The most popular glove in the Pacific Northwest The White Ox work glove has been used by loggers and woodsman has known for over 70 years. Why so popular though? Part of the reason is price (around $7 a pair); the intelligently configured cotton affords near leather safety, but for the price of canvas. Some also prefer cotton to leather as they feel it grips better in the wet conditions of the NW. 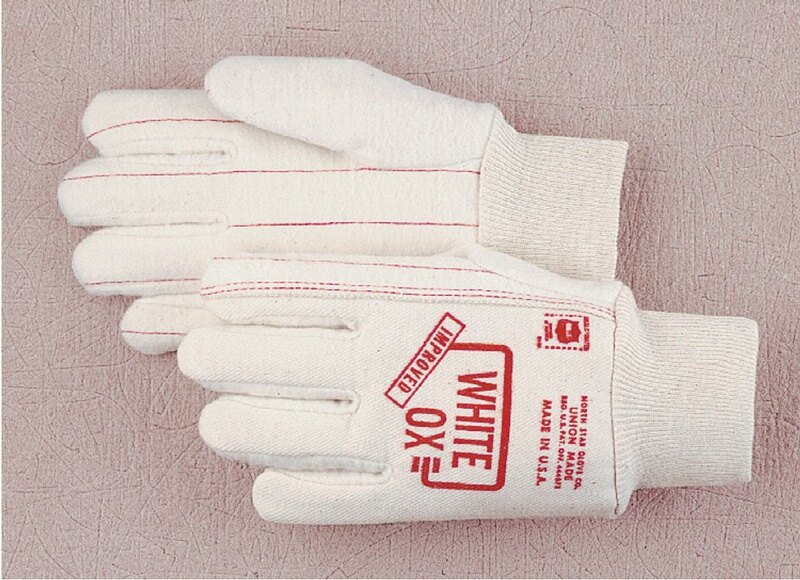 Sidenote: really like the classic stamped-red, simple branding on these and other gloves of their ilk (more). An updated version has a red wrist strap, as below. Fun fact: Due to various factors, including hiring practices, glove sizes have changed over the past 100 years. Where the U.S. Forest Service once ordered gloves in two sizes – Big and Bigger – the agency now buys seven sizes, including small. Again, thx to Rob Wekell (and Sherry) for providing text and images.